Today at Flash Memory Summit, Micron is announcing their next generation of high-end enterprise NVMe SSDs. The new Micron 9200 series is the successor to last year's 9100 series and uses Micron's 32-layer 3D TLC NAND flash and a new generation of Microsemi SSD controllers. 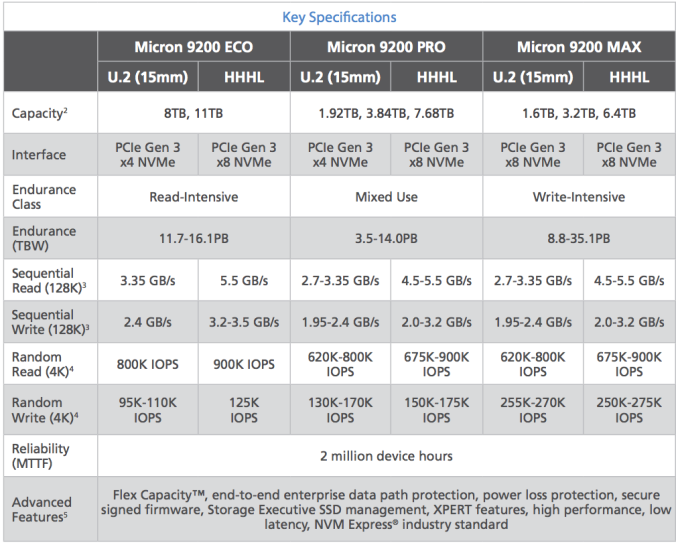 As with the 9100 series, Micron's 9200 series covers a wide range of capacities, but adds a third tier of write endurance: ECO joins the PRO and MAX tiers, respectively aimed at read-heavy workloads, mixed workloads, and write-intensive workloads. The Micron 9200 series will be available in either 2.5" U.2 form factor or PCIe add-in card. Thanks to the new generation of SSD controllers, the add-in card version can now use a PCIe x8 interface and offer significantly higher sequential access performance than the U.2 version, with read speeds reaching up to 5.5GB/s. The range of capacities is also far different from the 9100 series, which topped out at 3.2TB for the 9100 PRO and 2.4TB for the 9100 MAX. The 9200 MAX now offers up to 6.4TB, the PRO up to 7.68 TB, and the new 9200 ECO is available in 8TB and 11TB capacities. Micron's enterprise SATA SSD lineup moved to 3D TLC NAND early this year with the introduction of the 5100 series. 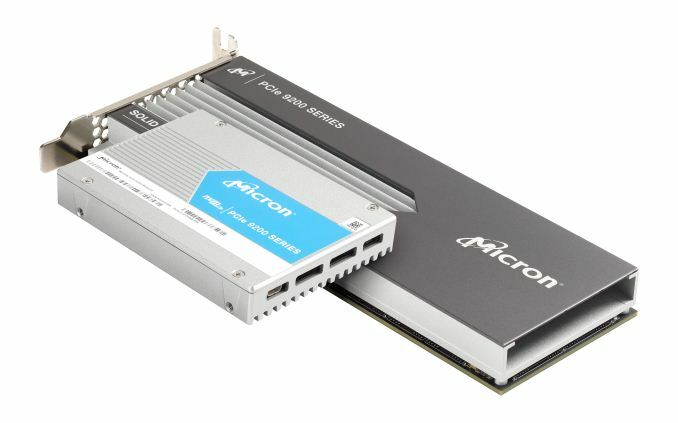 Micron's 7100 series of lower-power enterprise NVMe SSDs has not been replaced with a 3D NAND-based successor and it appears Micron is phasing out the current generation.